Since the human adult body consists of 60% water, for numerous health reasons, it’s important for us to drink the recommended 8 glasses of water a day. But glass after glass of plain ole’ H20 can get boring. If you get bored of water, try adding your favorite fruit and herbs in your water to ‘mix it up’ while quenching your thirst. Here are a few water infusing recipes that we recommend trying. Slice a cleaned (peeled or unpeeled, depending on your preference) cucumber into 1/4th inch slices. Slice the lemon into 1/4th inch slices. 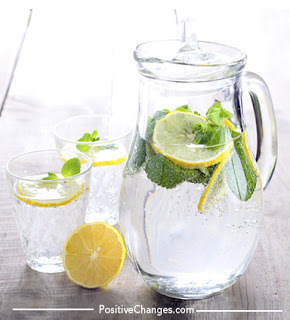 Add cucumber slices, lemon slices and mint leaves in the bottom of the pitcher. Cover with ice and add water. Place in fridge for an hour before serving/drinking. Slice a cleaned (peeled or unpeeled, depending on your preference) cucumber into 1/4th inch slices. Add cucumber slices in your water, and top it with ice. Allow the cucumbers to marinate in the fridge for at least an hour. For best results, allow it to marinate overnight in the fridge. Drop apple slices in the bottom of the pitcher, and then the cinnamon stick. Cover with ice, and add water. Place in the fridge for 1 hour before drinking. I'm amazed with the results I have received! I'm down 15 pounds. These detox pills surpassed my expectations and I feel confident with myself in and out of my clothes. The fruit infuser unit sits separately in the middle in the main bottle so it’s simple to add additional fruit without all the mess. It's available in two vibrant colors for more information.